In a part of the world that knows so much poverty and misery, the island republic of Sri Lanka has been a beacon of hope. Blessed with a magnificent climate, breathtaking scenery, and an abundance of natural resources, this nation of 15 million people has shown the world an example of sound development. But in recent months, the calm of this beautiful land has been shattered. Tensions between rival elements of the Tamil and Sinhalese populations have boiled over into violence and civil strife. Even here, in a land that should be a tropical paradise, human beings find it impossible to live together in peace. Recently I visited Sri Lanka for the third time. Sri Lanka is a small but prosperous island just off the southern tip of India, and it's just about halfway around the Earth from Pasadena, from where I'm speaking now. I travel all over the world as chairman of the Ambassador International Cultural Foundation, and I've traveled in the interest of world peace. Now they were having an episode of terrorism in Sri Lanka at the time, and I was invited to a news conference by the press of the nation, both newspaper, radio, and television. After this news conference, I also spoke at a banquet where I was a guest. The banquet was attended by virtually all of the cabinet of the Sri Lankan government. During its long history, the island nation of Sri Lanka has had many names. The Romans called it Taprobane, while as a part of the British Empire, it was known as Ceylon. Arab traders who once plied the Indian Ocean called it Serendip, from which we get the word "serendipity" — the finding of good fortune by chance. Certainly, Sri Lanka is a fortunate land. Many varieties of fish teem in the warm, blue waters that surround the island. Behind the palm-fringed beaches, many varieties of crops grow in the fertile soil of the interior. Cool, green mountains rise to 8,000 feet. On their slopes, the world's best tea is grown, and is one of Sri Lanka's major exports. In the last few years, this country has been making great strides towards development. The average lifespan equals that of most Western nations, and 85% of the population is able to read and write. This small republic has not had to wrestle with many of the problems that other nations in this region must face: famine, overpopulation, and relentless grinding poverty. Yet, in recent months, Sri Lanka has been torn by terrorism and civil strife. Tension between the Sinhalese and Tamil populations reached fever-pitch, and this peaceful island was rocked by a wave of riots and violence. Homes were burned, businesses looted, and hundreds were killed and maimed. Even in Sri Lanka, a land blessed with so many advantages, people have not yet solved the problem of living together in peace. In a press conference on the first day of Mr. Armstrong's visit, this problem of internal violence was the main topic of discussion. Well, all our problems are caused by human nature, and human nature is essentially selfish. Now, I can explain those things, I can say that it comes from self-interest, from a spirit of competition, always from the point of view of the interest of one's self, or one's party, or one's race, or one's religion, or whatever one is a member of, but we're living in a competitive world. We're living in a world that is based fundamentally on the philosophy of "get", and so we still do not have peace, because people do not know the way to peace. The way to peace is having concern for your fellow man. The way to peace is love. The way to peace is cooperation, and helping one another, and having a loving concern for the good of other people. And that gets into human nature. Now I cannot change human nature. I can talk about it, and I can explain, and I can give the reason, but every one of you must make up your own mind what you're going to do. I can't make up your mind for you, and that's the same with everybody else on Earth. I can't make up the minds of other people. I can only make up my mind what I want to do. But I can explain the truth, and the cause of wars, and the way to world peace. And it will not come until mankind comes to have love for his neighbor. And today, man doesn't love his neighbor. A nation doesn't love other nations; they love their own nation. And so we have competition, and that leads to, often to war, and individuals come to what you're having here right now, the kind of violence that's come into terrorism. And terrorism comes in the same way as war, from the wrong attitude of mind, the wrong desire of just selfishness and of opposition toward other people, and wanting to use force of some kind to have your own way against other people. I cannot, I don't have a magic wand, I can't wave a magic wand and just say the world has peace. You can't, can't bring it about that way. I have to look at the facts as they are, and the facts are human nature. [audience question] "What I feel, what you have just said, is only philosophy, and does not offer any solution to our problems. How will that produce peace now?" It won't produce peace now. I'm just telling you the facts, that what will produce peace. And I say to you, that we human beings are not going to produce peace. I think that all religions at least know that there is a higher power. Many of them don't know what that higher power is. They don't have it defined, perhaps, because they don't know. But there is a higher power, and that higher power is going to have to come and bring us peace. We're not going to bring peace, but the great creator God is going to have to intervene and bring us peace, if he has to force it upon us. And that's the way peace is finally going to come. [audience question] "As for Sri Lanka, we will pray to God to solve our ethnic problem, but I don't think even God can promote peace in this country." I say to you that God could intervene right now, but that is not his will to do that, and he is not — I can tell you that — he is not going to intervene right now. He's going to let us learn some lessons. Human beings do not know that they should love their fellow man, and so we go about loving our own selves, instead of our fellow man. And God is going to let us punish ourselves, and bring about wars and kill so many people, it will come to the place where we would destroy every man, woman, and child on the face of the Earth. The weapons of mass destruction now exist — United States has them, the Soviet Union has them, France has them, China has them, other nations are beginning to have nuclear weapons. And a nuclear war could erase all human life from this Earth, and conditions are going to come, and men are going to go on fighting one another, and men are going to go on. I can't change their minds, and no other man can change their minds, and men are going to have to learn that lesson. They're going to come to the place where they would destroy the last man or woman and child on Earth. Then, the supreme God is going to intervene before that happens, and he is not going to intervene until that, until we learn our lesson. Humanity won't learn. I can tell you the way to peace, but you won't believe me. You men right here won't believe me. The world won't believe me, and I can't bring peace unless you would believe me, and you won't. I'm speaking very plainly. I represent that higher power, and I know what he proposes, and I know what he is going to do. And he won't do it until we have punished ourselves to the place where we're willing to submit to him. The trouble is, neither side in this problem that you're having here right now is willing to submit to that higher power, and as long as you won't, you're going to fight and have trouble. And we're going to have to come to the place where we have to rely on him to do it for us. During his visit to Sri Lanka, Mr. Armstrong visited the Mahaweli development project. This irrigation and hydroelectric system will control the water of the Mahaweli Ganga, the country's longest river. This is an age-old dream of Sri Lanka's rulers. When completed, the system of dams and reservoirs will open up one million acres of land for cultivation. Preparations are underway to resettle thousands of poor and landless families on these new crop lands. The Mahaweli project will also generate hydroelectric power to serve the needs of the country. At a luncheon hosted by Deputy Minister of Fisheries, Mr. G.M. Premachandra, Mr. Armstrong was invited to speak before many top-ranking government officials and business leaders. Mr. Armstrong explained why, even in the midst of progress and advancement, people still cannot overcome the problems of human nature, as they resort to violence and terrorism. Distinguished ladies and gentlemen, this is really my third visit to your beautiful country here, and I've been really a little surprised to see that some of the modern warfare that we have come to in the world is reaching you and troubling you here. All over the world, we have problems, problems that seem to have been unsolvable. And I have talked with heads of government in many, many parts of the world. In every government, they have their troubles, in every nation, and the troubles are greater than human minds seem able to solve. Now I've been called an unofficial ambassador for world peace. We do work for peace, and we want peace. In fact, the world wants peace, and the world has been trying every effort for peace. In my lifetime, when I was a young man, the United States president Woodrow Wilson wanted to have peace, and he had the idea of a League of Nations, but the organization established didn't have any teeth. It could propose things, but it couldn't enforce what it imposed or what is suggested on any nation, and nations continued to be selfish. World War I was supposed to be the war that would end all wars. There was never going to be another war. And that peace, if we could have called it that, had just come of age about 21 years, when World War II broke out. World War II, once again, was to be the war to end all wars, but it didn't end wars. There have been dozens of wars ever since, as since World War II in 1945, when it ended. But the methods of warfare seem to keep changing. And now, another type of warfare is blossoming out in the world and exploding all over here and there, and that is terrorism. That is the latest form of warfare, and that is individual, and it breaks out in dozens and hundreds of places anywhere. Now why do we have such a world? I say to you that while we work for world peace, and I work for world peace, and our foundation, the Ambassador International Cultural Foundation works for world peace, we ourselves are not going to bring world peace now. To think that we can bring world peace immediately is wishful thinking. We need to face the practical facts of the way things are, and we need to go back to the origin of human life and see how it all started, and why we are in the kind of condition that the world is in today. How did we come to get this way? Today, it seems that human beings look at the effect and see the trouble, and they try to work with the effect and cure the effect, instead of looking at the cause and what caused the condition in the first place, and changing the cause. There is an almighty, divine creator, and the human race started with one man, created from the dust of the ground. But this first man, Adam, disobeyed his creator, and he took to himself the knowledge of good and evil. He took to himself self-reliance to rely on himself, and not to rely on, but to reject his creator. Now his firstborn son relied on himself. He got into a war with his brother and killed his brother. And humans have been doing that ever since, because humans and self-reliance are essentially and innately selfish. And so mankind started out with one type of philosophy of life. We might say that, broadly speaking, there are two philosophies of life, only two ways, broadly speaking, and one I like to simplify to its most simple terms. One is the way of give. Now that's the way of outflowing love and consideration for the good and welfare of others, of having concern for the welfare, the comfort, and the good of other people. And I call that the "way of give," to make it simple. The opposite way is the self-centered way, that I call "get." And this world has been on the "get principle" for 6,000 years, ever since this first man decided to just take to himself all the knowledge and self-reliance, and to rely on himself alone. Now the trouble with the human race is it has been relying on the human mind, and on human beings who are innately selfish. And that is the way of competition and strife against others. That is the way of jealousy and envy against others. That is the way of hostility against others, instead of love and cooperation, and outflowing concern for the good of others. And that is the way humanity has developed. And this idea of competition, of hostility, and of wanting to just acquire, to get, to receive for itself, has come down to our complex society today. Now today, we're in a world wherein, especially in this twentieth century, and more especially even, the last half of the twentieth century, we're in a time of awesome progress, of the great human accomplishment. But all of that progress and all of that accomplishment is in the field of materialism, of things that man can do and the handling of matter. But when it comes to the field of man dealing with his fellow man, there we have trouble. The whole world is in trouble, and the greatest minds in the world are unable to solve these troubles, because it's a case of mind dealing with mind, and a hostile mind dealing with other hostile minds is only increasing in trouble. So I say to you now, as a representative of that great creator, that the almighty creator is going to let mankind learn its lesson. A nuclear world war is definitely going to be started, and it is going to come. And unless that creator does exist, and unless that creator does step in and intervene supernaturally, and save us from ourselves, I say to you there won't be a man, woman, or child left alive on this Earth one generation from now. That is the state we have come to. Man is going to have to learn that he must rely on his creator. Man has set himself up in his own egotism that he is greater than his God. But Almighty God is going to intervene, and is not going to let us destroy ourselves. He has let us, he's going to let us come to the place where we realize how helpless we are, where we realize that we are unable to solve our problems. And when it has come to the place where if he delayed, there would not be a human being left alive on the Earth, then the great creator is going to intervene and send the Messiah back to this Earth in all the supernatural power of the great, eternal, creator God. And now I have available for you, if you would care to have it, a very eye-opening booklet on human nature: Did God Create Human Nature? [Human Nature Did God Create It?] Where did human nature come from? You can attribute almost all of the world's evils to human nature. What is human nature? Did God create it? Were we born with it? This will open your eyes. You have never understood the very nature that is probably within you. Now there's another booklet too, that I'd like to offer at the same time: World Peace How It Will Come? World Peace How It Will Come? It goes into much more detail than I did in the news conference and in some of the speeches in this program. At the same time, if you request those booklets if you're not already on our subscription list, you may have a full year's subscription to the world's greatest and finest magazine: The Plain Truth. The circulation now is over seven million copies, in seven different languages. The Plain Truth. And the cover story is how the United States looks ahead. The Plain Truth is a magazine explaining world news so that you can understand what it means and where it's leading, and what is going to happen. There is no magazine quite like it. Here's an editorial in this recent number: What's Wrong With Business and Industry? And here's another: The Truth Behind America's Moral Crisis. Here's another article on The Family and God's Plan for Mankind, the family, and what does that mean to our civilization? Here's another: Do the Dead Know What the Living Are Doing? Many want to know that, and do not understand. Here's another article: Canada's Troubled Economy. Another article: What's Prophesied for Russia and China? And there are other articles even besides those in this same issue. Now you may have that, and these booklets: the one on human nature, the one on World Peace How It Will Come. There's no charge whatsoever, no obligation. No one will call on you. We do not ask for money, and there will be no follow-up asking for it. 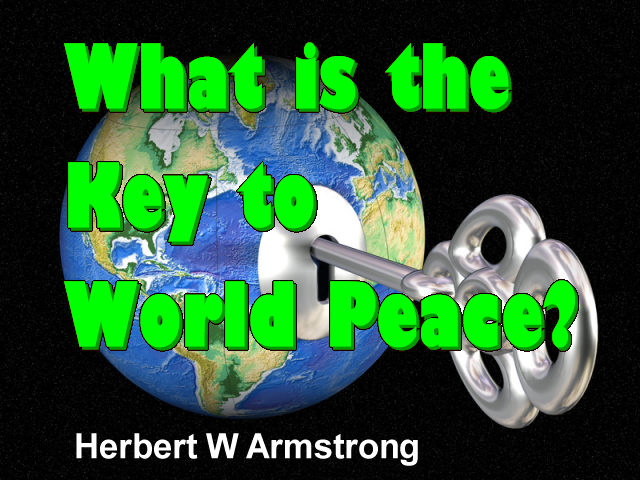 The address is just Herbert W. Armstrong, Pasadena, California. Herbert W. Armstrong, Pasadena, California, 91123. Or go to the telephone right now. It's a free call: 800-423-4444. That is 800-423-4444. So, until next time, this is Herbert W. Armstrong. Goodbye, friends.